Our showroom comprises of a variety of embroidery like applique embroidery work, indian embroidery, zari embroidery to make designer embroidered fabrics used in host of applications. Our products are mainly suited for wedding gowns, evening wear, Indian Bridal wear market and traditional Indian clothings. We offer an exclusive range of wedding gown embroidery. 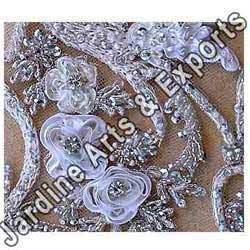 These wedding gown fabrics like embroidered fabrics, beaded fabrics, sequin embroidered fabrics, applique work fabrics, embroidered satin fabrics, embroidered net fabrics, beaded net fabrics exhibit some of the most exquisite designs and embroideries. 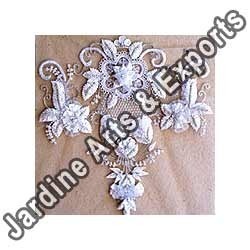 Techniques of embroidery used in our wedding gown fabrics include aari and zardozi with good quality material such as silken threads, beads, sequins, sworovski crystals in different colors and sizes, gold, silver and antique yarns and bullion, coils, cords etc. The embroideries for the wedding gown fabrics are done on all kinds of fabrics such as duches satin, crepes, georgettes, silk chiffons, organza tulles and laces. We unveil an exhaustive collection of traditional heavily embroidered Indian sarees that are sure to captivate any woman. Each and every piece is unique and has an extensive usage of beads, sequins and silken threads. 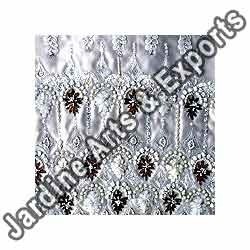 Multicolored beads have been used to create various designs for sarees embroidery like multicolor embroidery, beaded sequin embroidery, beaded silk embroidery, white beads embroidery that are gorgeous and at the same time ethereal. 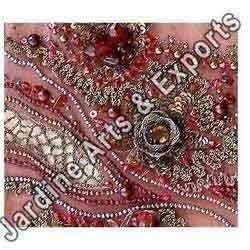 The collection includes beads work with heavy sequin embroidery, sequin & beads embroidery, beaded embroidery with silk thread, white beads embroidery on silk fabric. 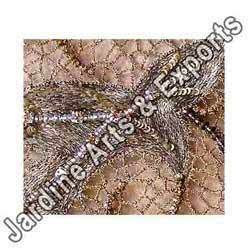 Our exclusive range of party wear embroidery like metal embroidery, sequin beaded embroidery, golden thread embroidery, beaded embroidery, silver bead embroidery on various fabrics exhibit some of the most exquisite designs and embroideries. 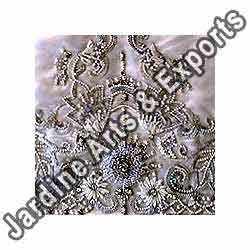 We use various techniques of embroidery which include zardozi with good quality materials, silk or resham threads, beads and sequin work, crystals in different colors and sizes, gold, silver yarns and cords. Presenting a mesmerizing collection of lehengas embroidery like swarovski crystal embroidery, beaded embroidery work, crystal embroidery work, sequin embroidery work for Indian traditional lehengas. Embroidery on lehenga choli fabrics exhibit some of the most ethnic designs. Each design is different from the other thus pampering the customer for choice. 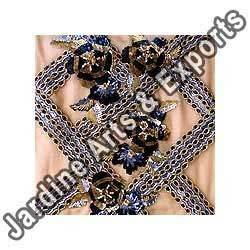 Superior quality threads, sequins and beads have been used to create wonders. The variety of designs included in the collection are sequin & metal work embroidery, beads & swarovski crystals on a variety of fabrics. We present a rich collection of evening wear embroidery like zari embroidery, beaded silk embroidery, swarovski embroidery, cut work embroidery, sequin embroidery for evening gowns, dresses, jackets and skirts. These fabrics are available with intricate and beautiful embroidered patterns. Each fabric is different from the other in respect of colour, design, pattern, fabric and material used in the embroideries. Fabrics such as silk, satin, crepe, georgette, tulk, lace, leather, suede organza etc. are used extensively. We present a unique range of salwar kameez embroidery like multicolor sequin embroidery, silver thread embroidery, glass sequin embroidery, metal thread embroidery, silk thread embroidery on various fabrics. These fabrics are available in different color combinations and patterns. The embroidery done on the salwar kameez is elaborate and thus makes them the first choice for buyers. Superior quality silk thread, beads, sequins and metallic threads are used to create these magical designs. The collection includes silk threads embroidery with sequins, colorful beads & silk thread embroidery, beads & sequins embroidery on a variety of fabrics, beaded embroidery in silk threads, metallic threads etc. 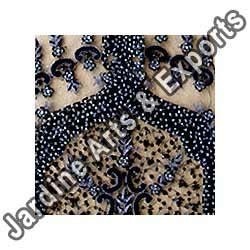 Our product range includes a wide range of beaded fabrics. Our range of products include embroidered net fabrics, embroidered satin fabrics, hand embroidered garments, embroidered laces and embroidery accessories. 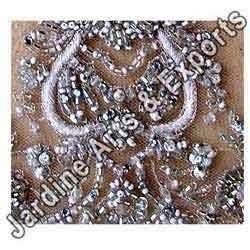 We are a leading Exporter of sequin beaded embroidery, multicolor embroidery, metal embroidery, zari embroidery and swarovski embroidery from Mumbai, India.